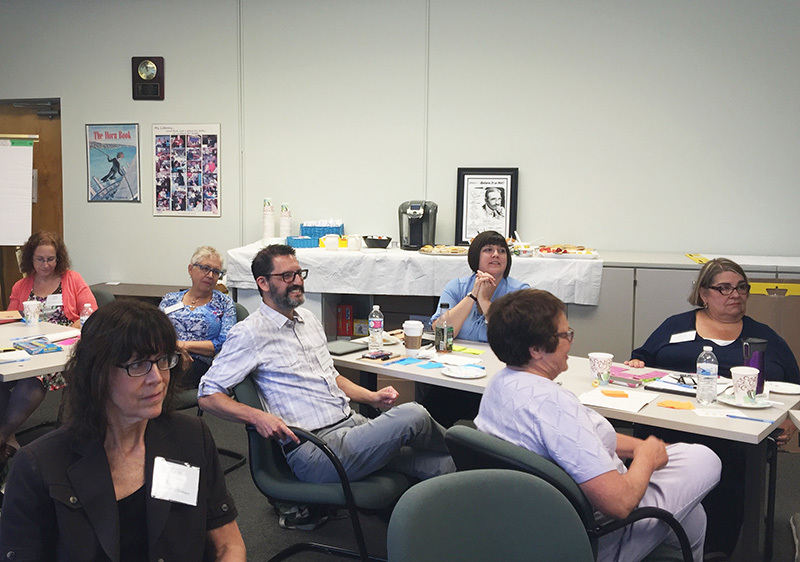 Following a morning workshop facilitated by Geoff DiMasi and Kate Clayton from P’unk Ave, LibraryLinkNJ’s Executive Board held their first monthly meeting of the new fiscal year. New Board President Kimberly Paone says "I'm fortunate to follow in the capable and kind footsteps of Candice Brown to serve as the new President of the LibraryLinkNJ Executive Board. It is an exciting time for our organization, as we welcome several new members to the Board, and begin the strategic planning process. I look forward to working closely with Kathy Schalk-Greene, the LLNJ staff, and the Board to continue to provide support, service, and surprises to our member libraries." We echo Kimberly’s warm thanks to former Board President Candice Brown and offer her a big cheer for having led the Board with enthusiasm, skill and good humor through FY16. Get to know your Executive Board members! The Executive Board page on our website provides a complete list of Board members, as well as contact information for each of them. Delivery services to schools will resume on Monday, September 12, 2016. The delivery policies, practices and procedures are available on the delivery page of our website. On-Site, On-Demand: Let us Help You Make a Difference! For all the details on how this service works, go to The On-Site, On-Demand Page. Ongoing professional education is essential in the work lives of all staff members, and we want to make it as efficient and cost-effective as possible. We will subsidize up to $750 of the cost of one staff development workshop a year for participating member libraries of all types. 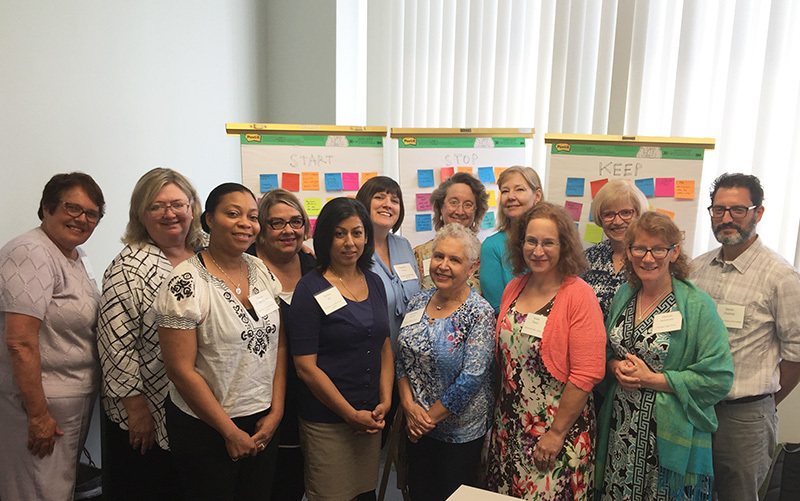 Professional Development and Self-Care is one of the key goals in the Statewide Strategic Plan for the Future of Libraries in New Jersey. The On-Site, On-Demand Staff Development program directly supports this goal by providing libraries with the opportunity to help their staff acquire new skills and cross-train. LibraryLinkNJ offers a subsidy of up to $750 for each approved request. If you have any questions, please contact Joanne Roukens by phone (732.752.7720 or 866.505.5465) or email. Does your library offer public programs? Do you manage an increasingly complex set of events year-round, with staff working widely varying hours? Project management skills can help. By participating in LibraryLinkNJ’s Project Management Series, you’ll learn how to deliver all types of projects on time and within budget more consistently, using simple techniques to monitor and control processes and schedules. Guidance to help your library implement an actual project at the completion of the series. What: A series of face-to-face workshops and webinars, and guidance on implementing a project at your library. When: Registration for the full series of workshops and webinars will open on September 13, 2016, with a registration limit of 30 participants (no more than two from each member library). Where: The Monroe Township Public Library (Middlesex County) and via Adobe Connect. How much? The cost of participation for all events in the Project Management Series is just $50 per participant. Intrigued? Start saving dates and lining up administrative approval to participate by reviewing all the details at the full project page! If you have any questions, please contact Joanne Roukens by phone (732.752.7720) or email (jroukens@librarylinknj.org).